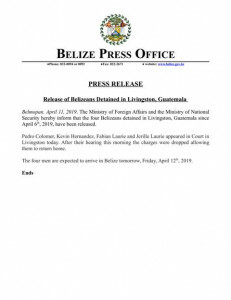 We’ve been reporting on the detention of two Belizean lawmen and two others in Livingston, Guatemala over the weekend. The men: coastguard officer Pedro Colomer, police officer Fabian Laurie as well as Kevin Hernandez and Jerille Laurie were charged for firearm offenses and were being held at a prison in Puerto Barrios. They appeared before the courts today where the charged were dropped, allowing them to return home. A joint release issued this evening by the Ministries of Foreign Affairs and National Security says that after their hearing this morning, the four men are expected to arrive in Belize on Friday, April twelfth, 2019. The release does not say how or why the charges were released. There is a report that the release of the men is linked to the purported release of three Guatemalan men, who were detained in Belize and that that government made a request for their release. In an interview with News Five, Captain Elton Bennett of the coastguard was particularly irate that Colomer had tainted the image of the coastguard. It is expected that the lawmen will face disciplinary actions.